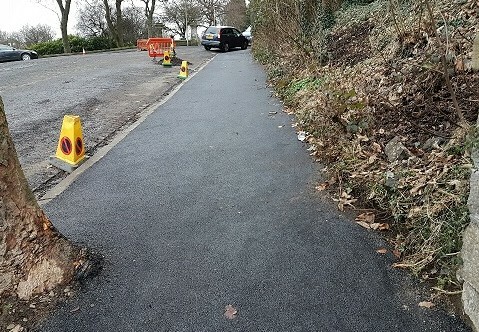 Having, on behalf of residents, raised the poor condition of pavements along Balgay Road and in the short west part of Scott Street west of Balgay Road (towards the Balgay Park entrance) in the past, I am pleased to see the long-awaited resurfacing now being completed. On behalf of residents, I recently raised with the City Council’s Roads Maintenance Partnership road flooding concerns regarding Balgay Road. “Balgay Road has been checked and all the gullies are clean and clear although have been noted to be slow-running in times of very heavy rain. Previously, any particular issues with ponding water have been dealt with by the gully machine. 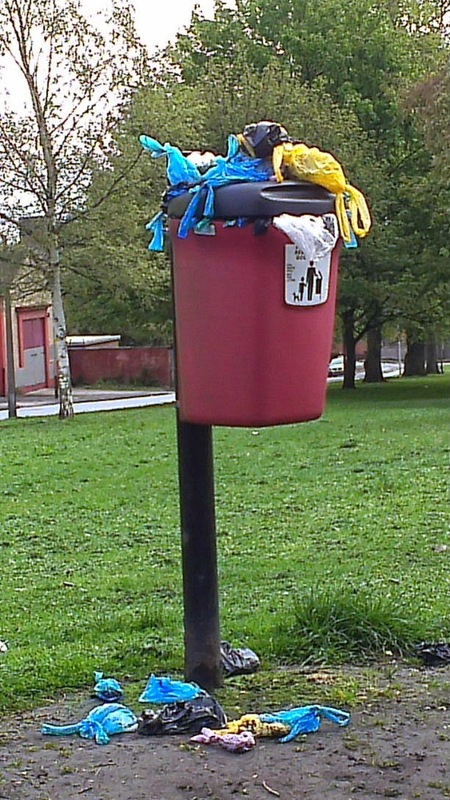 I have also raised similar issues at nearby Sycamore Place, following residents raising these with me. 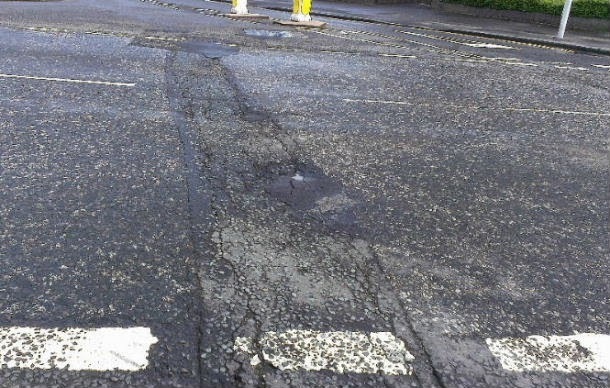 This morning, I had useful site visits with roads inspection staff from the City Council looking at poor pavement condition in part of Perth Road and also the poor conditioned road surface at the busy Balgay Road/Blackness Avenue/Blackness Road junction (see right). With regard to this roads junction, I am pleased to say that the junction will be reinstated with work starting next Monday (12th May) – weather permitting. The work will take a maximum of 2 days but might be completed in one day. As temporary traffic lights will be required during the improvements work, these will be put in place only after the rush hour on Monday morning. Later this morning, I had a very useful meeting with our new senior police officer for the West End (and the remainder of what the police term ‘Dundee South’) Inspector Gary Ogilvie, at which we discussed West End policing issues. Earlier tonight, I attended the Annual General Meeting of Community Spirit – the community group for the “north” part of West End Ward, covering Tullideph, Pentland, Ancrum and the Cleghorn area. 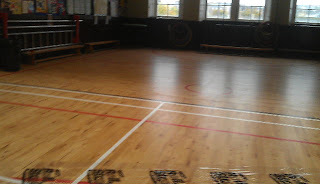 The meeting took place in the Mitchell Street Centre. Guest speaker was Ian Ford of the Friends of Riverside Nature Park, who gave a very interesting presentation on the development of the park. Thereafter, I had the pleasure of chairing the actual AGM part of the meeting. Sandra Myles stood down as Chair after four very successful years in the role and we all thanked Sandra for all she has done for the group and the local area – I’m pleased to say Sandra will still be attending Community Spirit’s meetings. New Chair is George Chalmers and Len Jamieson is continuing as Secretary. One final update for today. Residents complained to me that the dog bin in Logie Avenue at Ashbank Road was “rather full” – as you can see (left) that’s rather an understatement! 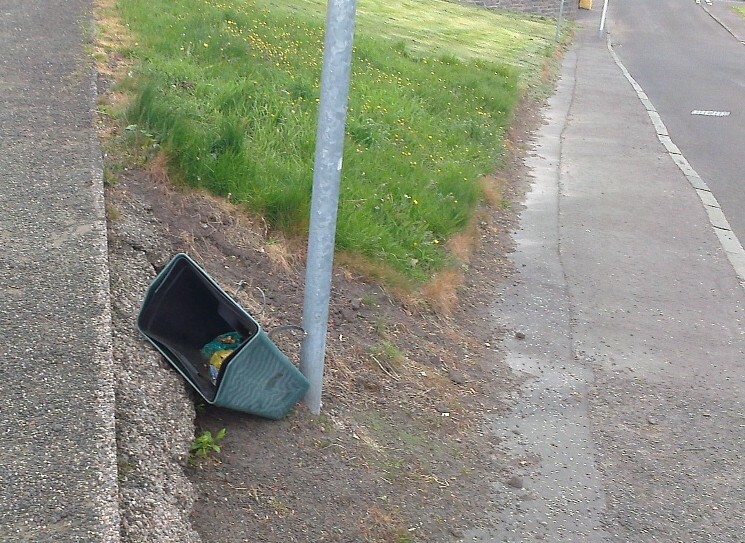 The Environment Department has assured me this will be urgently tidied. 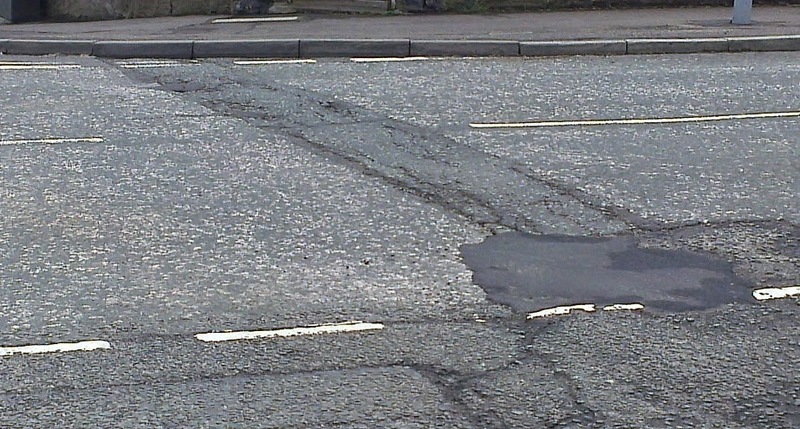 I have arranged to meet the local roads inspector on-site to discuss possible improvements here. Residents have reported to me that the litter bin at the corner of Sycamore Place and Balgay Road has been ripped off its post See right. I have reported this to the City Council and asked for a repair. 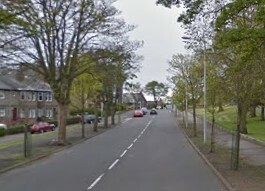 Yesterday, I took part in a site visit with the Head of Transportation and a Senior City Council Engineer at the junction of Balgay Road/Blackness Road/Blackness Avenue – see right. Last year, I welcomed proposed road safety improvements at this junction as constituents have mentioned what a difficult junction this is – very busy and many vehicles making right turns. 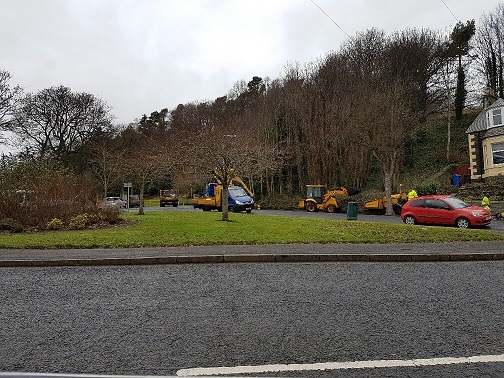 Lining to the west on Blackness Road has been altered to improve vehicle movements coming towards the junction and council officers assured me that its effectiveness will be monitored in the coming months. I also had the pleasure of a walk round the improvements underway at Blackness Primary School that include new window blinds, new lighting, staffroom refurbishment, new junkers timer sports floor in the gym – see right, wood treatment, windows improvements and improvements to the entrance and main stairwell. I had previously queried the cost of new cleaners’ cupboards and this was reviewed and reduced in cost I was pleased to note. Also yesterday, I attended a presentation by the Managing Director of Tayside Contracts that was well-attended by councillors and senior council officers. The presentation was extremely interesting and emphasised the importance of shared service provision at a time of real financial challenge for the public sector.